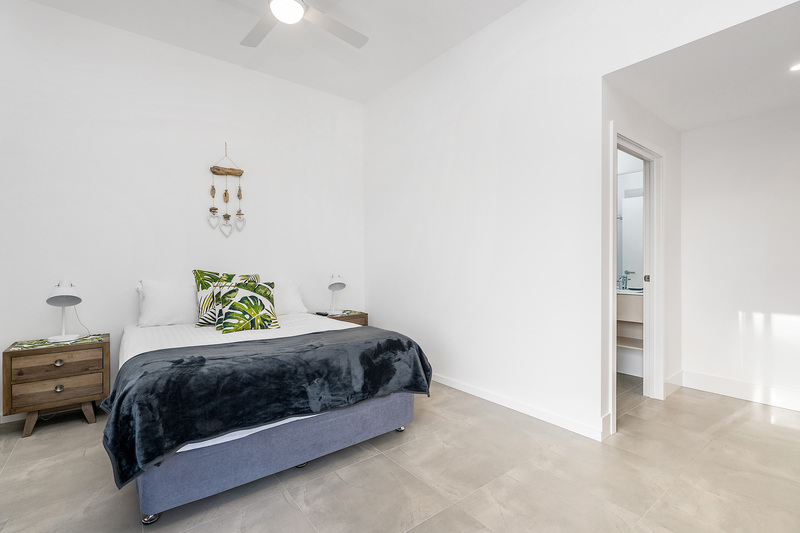 Be among the first guests to stay at the newly completed Wollumbin Haus in Byron Bay, just 1km from the sandy surfing beach and town centre shops and eateries. Enviably located, it enjoys scenic Hinterland views from the expansive front deck and master bedroom. 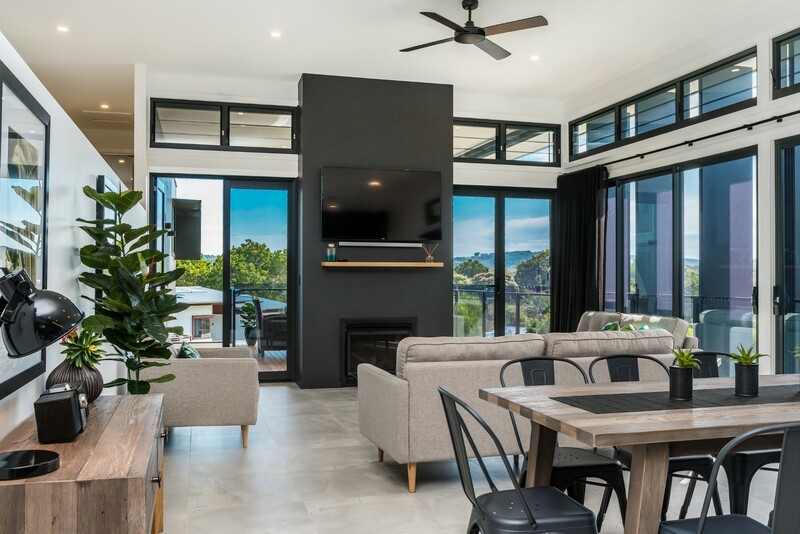 Beautifully finished to the highest standard with state-of-the-art furnishings, this luxury holiday home in Byron Bay has 4 bedrooms and 3 bathrooms to sleep 8 in the main house and studio downstairs. 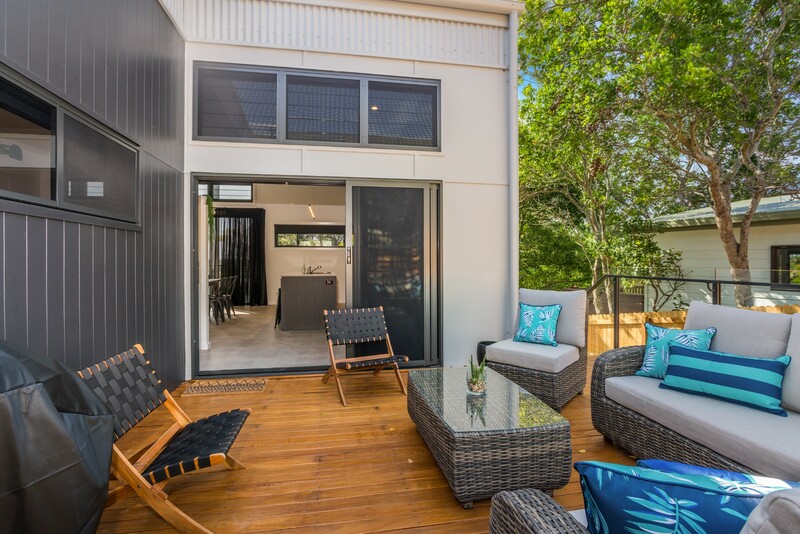 Outdoor living is a must with a shady deck area, furnished garden lounge and spacious front deck providing far-reaching views. There’s ample parking for 5 cars, so invite family and friends to come too. 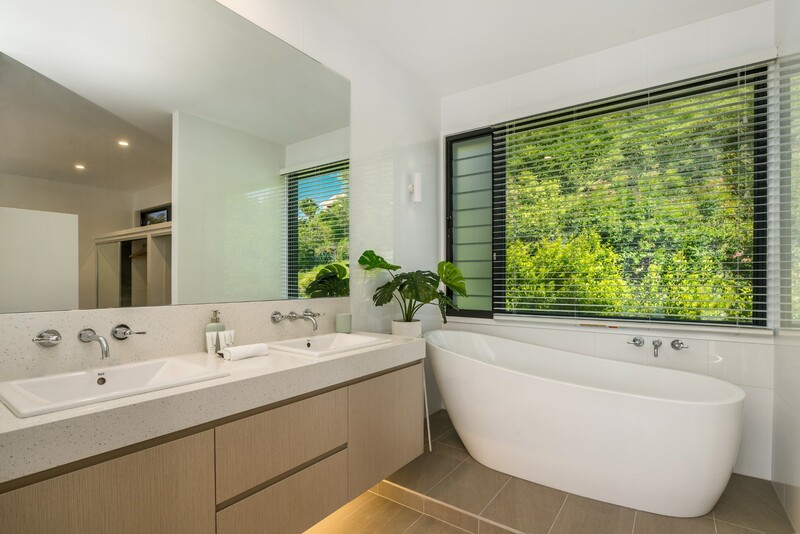 The open floor plan provides a spacious living area on the upper level and floor-to-ceiling glass windows flood the area with natural light. A full-height feature gas fireplace provides a focal point for putting your feet up and watching your favourite programs on TV. The stunning lounge and dining area boast contemporary furniture combining comfort with style. Reverse cycle air-conditioning and ceiling fans provide year-round climate control in the living area and master suite. 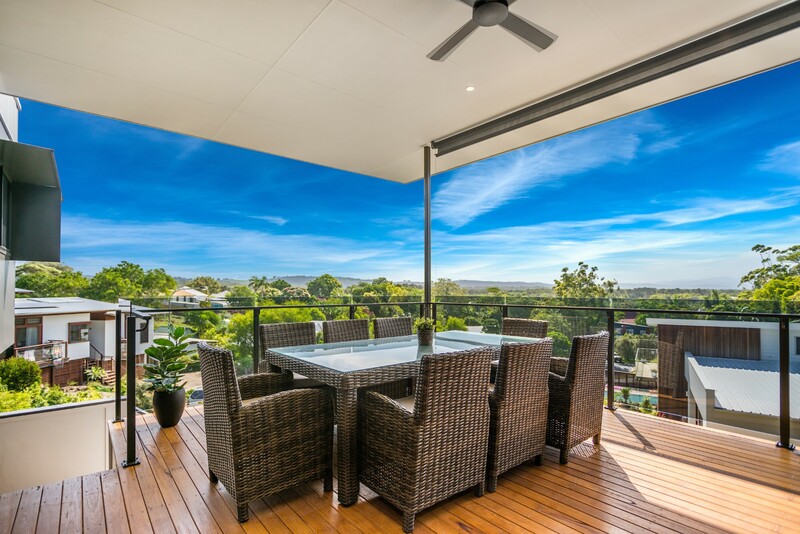 Fling open the doors and enjoy an indoor/outdoor lifestyle on the furnished upper balcony which has a BBQ area, deck flooring and unforgettable hinterland views. 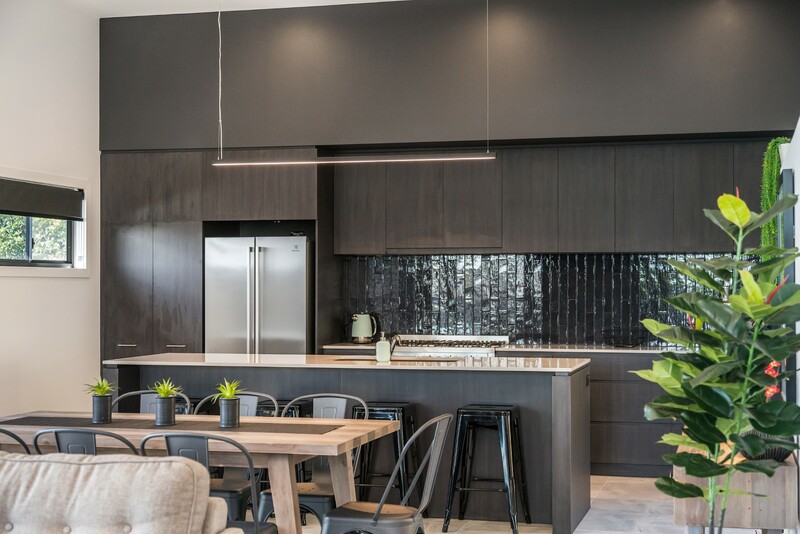 The stylish chef’s kitchen feature dark wood cabinets, black glass splashback, stone benchtops and stainless steel appliances. 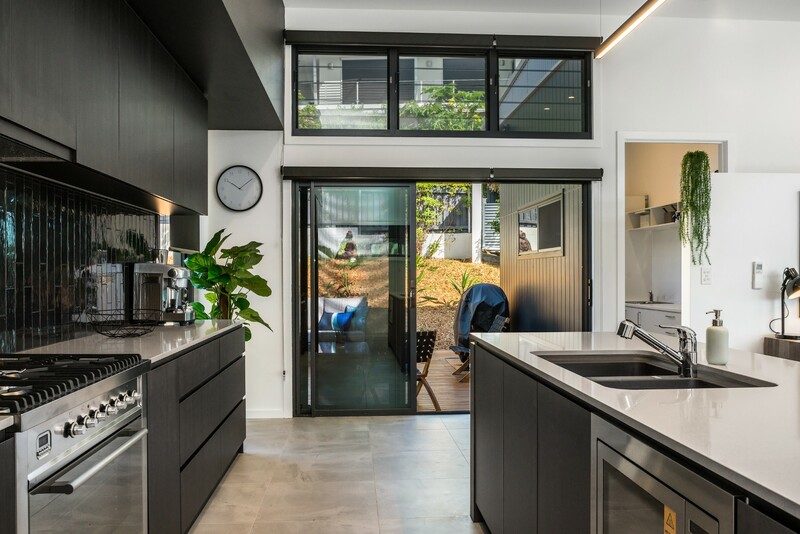 The island unit defines the kitchen area from the formal dining space and provides casual dining space at the breakfast bar. 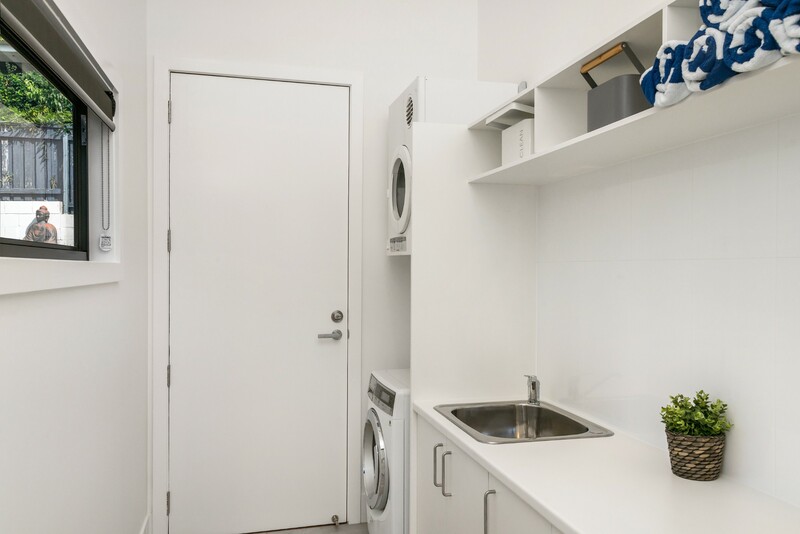 A separate utility room with washer, dryer and sink takes care of laundry. 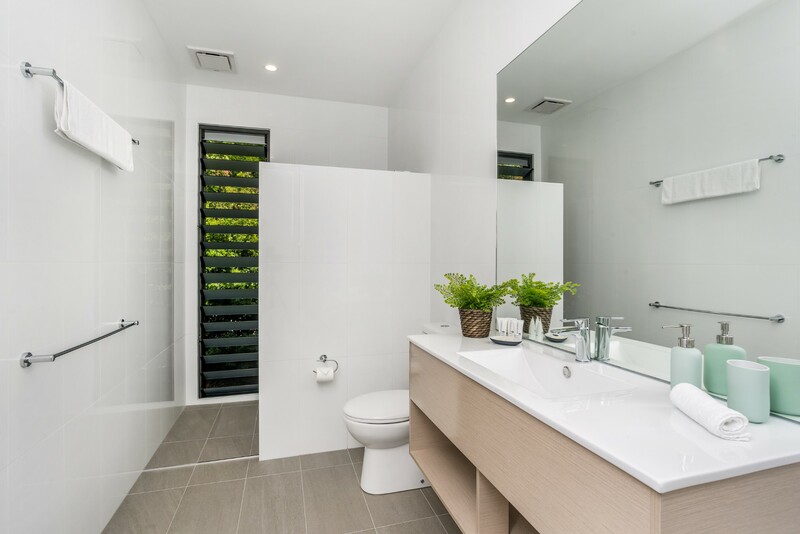 The main house has 3 bedrooms and 2 spa-like bathrooms (one ensuite with stand-alone bathtub) with a further ensuite bathroom in the studio. The master bedroom has air-conditioning, and all bedrooms have ceiling fans. There is room to sleep a child on a trundle, which can be made available upon request. A trundle suitable for a child is available on request. The landscaped garden features a fully furnished outdoor lounge and BBQ deck – the best place for relaxing with sundowners and toasting the sunset views over the Hinterland. 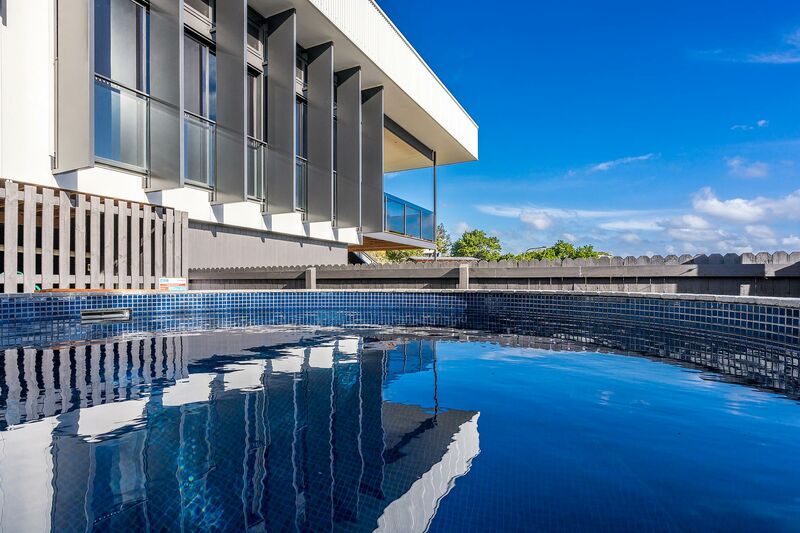 A sparkling pool offers a safe and convenient alternative to the beach as well as endless entertainment for children. Off-street parking for 5 vehicles: 2 in the carport, one in front of the studio and 2 on the drive. 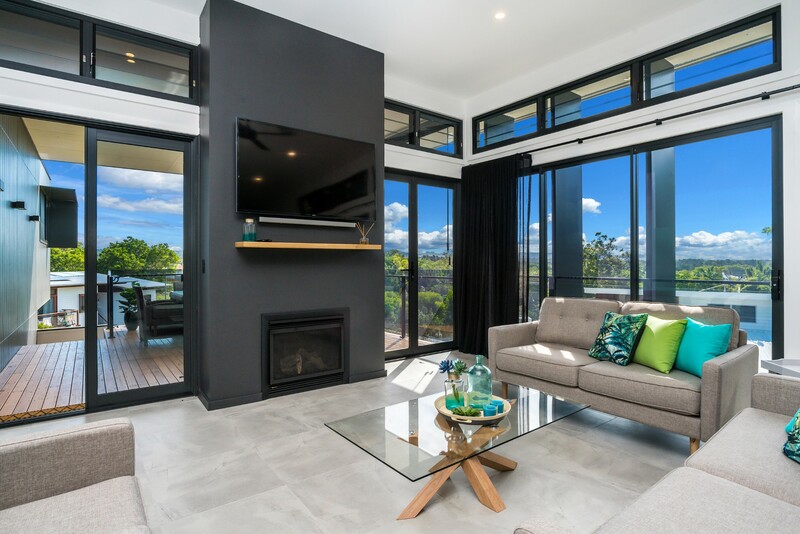 Well-located on Wollumbin Street, this Byron Bay holiday home is the epitome of style, luxury and contemporary design. 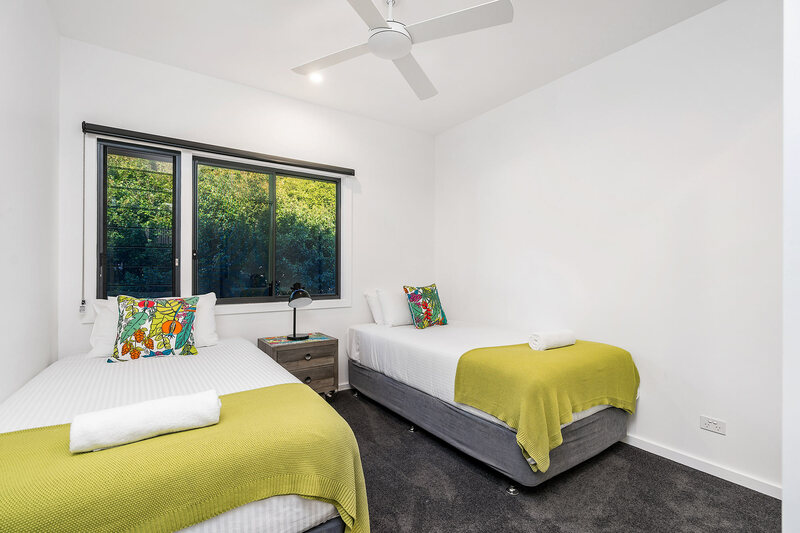 Completed in 2018, it is 700m from the heart of Byron with its shops, ice cream parlours, cafés and restaurants. 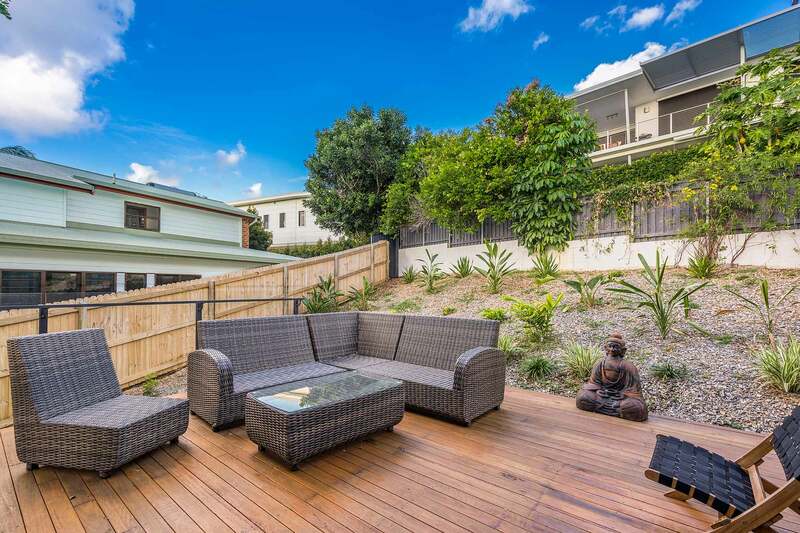 The beautiful sandy beach and rolling surf that Byron Bay is known for is just 1km away. The area has plenty of attractions for couples and families. Walk up to Captain Cook Lookout for stunning sea views and you may be rewarded with the sighting of whale spouts as these giant mammals migrate along the coast between June and November. Julian Rocks Marine Reserve at nearby Clarkes Beach is a prime spot for snorkelling and diving to see the caves and marine life. Scenic drives into the Hinterland will provide endless opportunities for walking, wildlife spotting, bird watching and shopping for local produce at farmer’s and artisan markets. 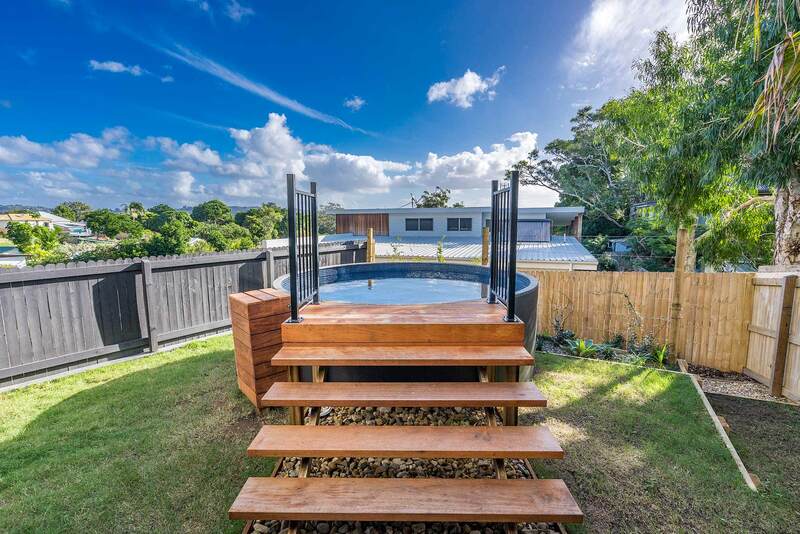 This outstanding holiday rental in Byron Bay is 68km from the Gold Coast Airport and 33km from Ballina/Byron Airport. 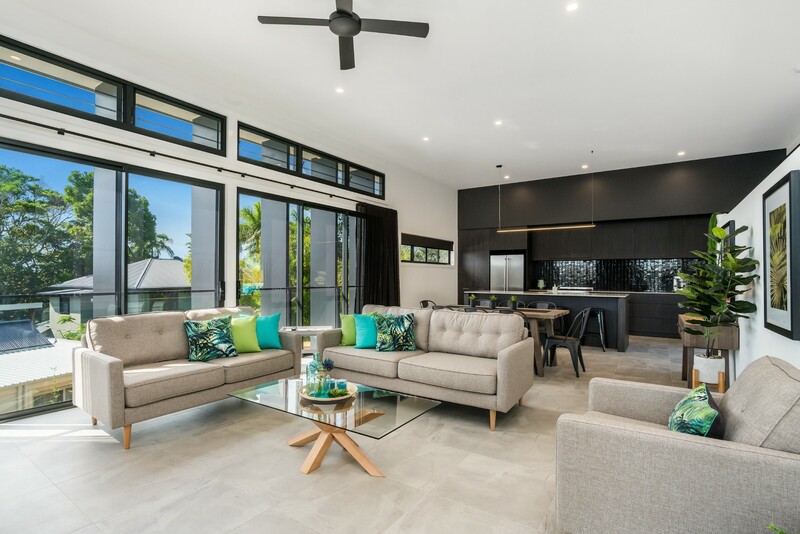 Wollumbin Haus makes a unique place for larger families and groups of friends with its ample indoor and outdoor space for entertaining. 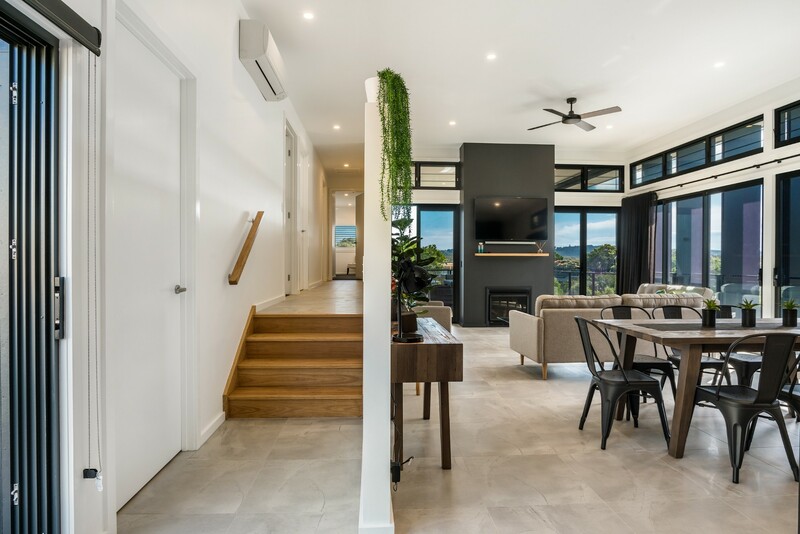 Group restrictions - maximum of 8 adults at the property unless otherwise approved directly with A Perfect Stay/Byron Bay Holiday Rentals. Strict noise policy and no parties permitted - fees and eviction can apply for security call-outs. See terms and conditions for further information. No commercial activities or events permitted including but not limited to hens/bucks events, engagements or weddings. 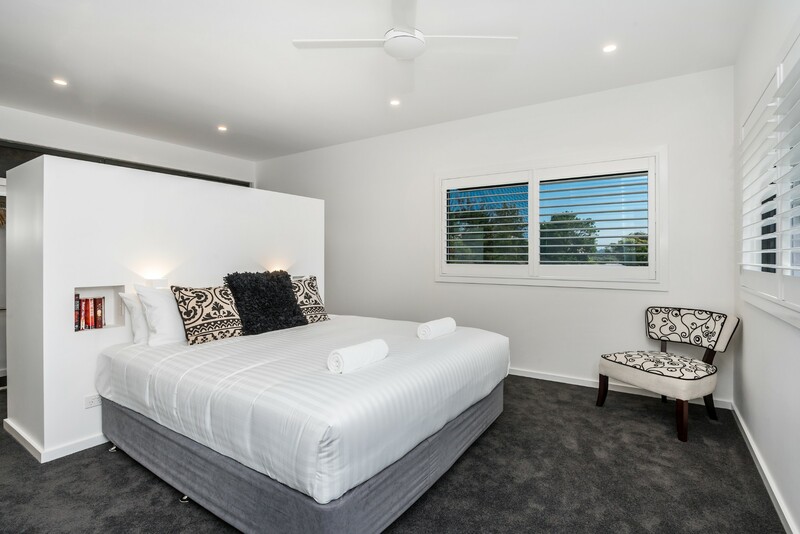 Intimate events, photo/video shoots may be arranged directly with A Perfect Stay/Byron Bay Holiday Rentals. Additional fees and T&C's apply. No Schoolies or school-leavers permitted. No smoking inside the property. 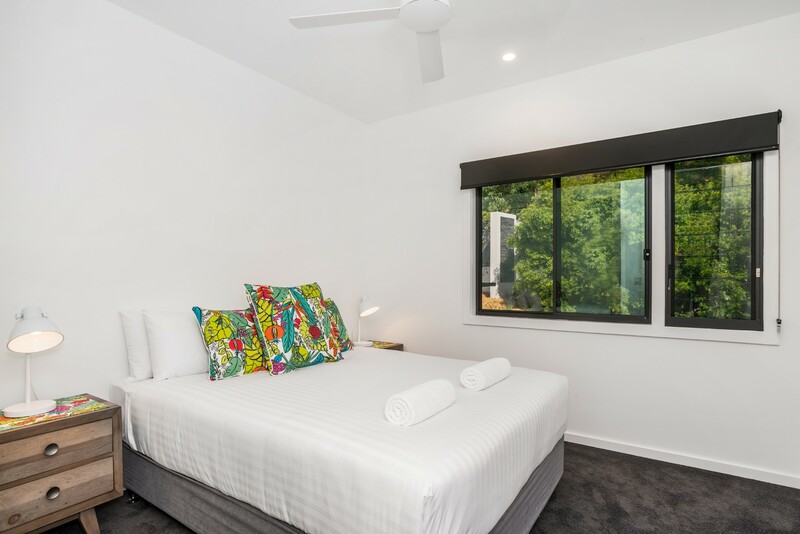 If dates include both Christmas Day and New Year's Eve a 12-night min stay applies, unless otherwise approved directly with A Perfect Stay/Byron Bay Holiday Rentals. We reserve the right to cancel any bookings made that do not comply with these conditions. Breaches of these conditions during your stay may result in immediate termination without refund of rent or bond. A deposit of 50% of total rent (including booking fee, cleaning, linen, and credit card fees) is required at time of booking. Final payment is due 30 days prior to arrival. If the booking is made within 30 days of arrival, full payment will be required at the time of booking. Bond of $1000 will be processed 1-3 days prior to arrival. This home was perfect for our weekend long business stay. 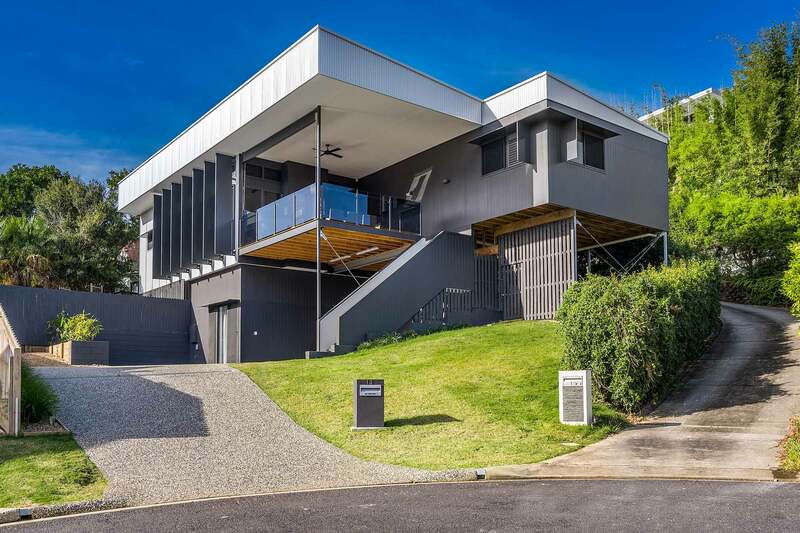 The large modern home suited our group well, was centrally located to town and within walking distance of everything. Loved the home, super spacious and modern! Thank you for reviewing this property. Are you flexible with dates? Different rates & length of stays apply depending on time of year. Try selecting other dates or contact our reservations team for details. Use the form below to submit an enquiry, we will be in touch to discuss your request.